We provide title agents, attorneys, and realtors with unrecorded and municipal lien searches for all of the cities and counties in the great State of Florida. We only report items not recorded in the county clerk’s official records. A Florida Municipal Lien Search protects a buyer from unknowingly acquiring debt from municipal charges. A property lien is a notice attached to a property, indicating that a creditor claims you owe it some money. Florida Municipal Lien Search offers comprehensive residential and commercial permit lien searches. Attorney, title agent or realtor in Florida in need of an unrecorded or municipal lien search? You’ve come to the right place. 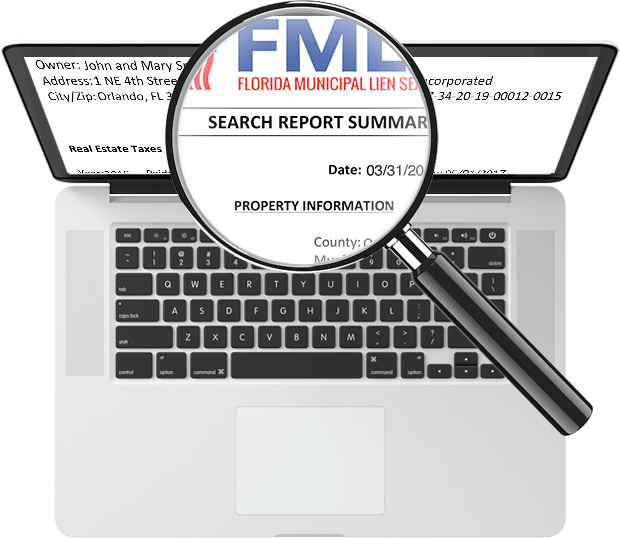 Florida Municipal Lien Search, LLC is a privately owned and operated company focused solely on lien searches for all of the cities and counties in the State of Florida. Our dedicated team consists of lien search agents and a client satisfaction manager. We are a trusted source with a proven track record of fast, reliable searches for our clients. A Florida lien search, F.S. Chapter 159 search, is typically required of title agents to remove exceptions when issuing title insurance policies. However, many title companies are only performing lien searches for recorded data and are not conducting unrecorded lien searches on properties prior to closing. We pride ourselves on doing it right, the first time. If we didn’t perform up to your expectations, it’s free. No need to wait in an office or fax papers, simply order online and we will take it from there. Get the status update of your lien search on your schedule wherever you need it by desktop or mobile device. Our reports are formatted so that you can get the information you need very easily. Log in to your own client portal to see the status update of your search. We don’t charge any hidden fees for any of our services. What you see is what you get. We are insured for your protection and carry a one million dollar E&O policy. We like a challenge, and understand that sometimes it simply needs to be rushed. No worries! We’ve got you!! Simply send us a copy of the Cancellation of Contract. No charge for our search fee.